Born into a family of passionate gardeners and designers, David fell in love with orchids at the age of ten, then moved on to propagating plants to sell at the family business. After completing an Associate Diploma in Horticulture at Burnley, he began a thirty year career in retail horticulture, including stints in garden centres in Ireland and New Zealand. Managing the garden division at Rivers of Yarrambat allows David to indulge his love of plants and a passion for customer service. He has also gained a Diploma in Business Frontline Management. Rivers began as Plenty River Nurseries in 1981 and has established a reputation as a leading destination garden centre. Now a multi faceted retail & leisure business, it is run by the second generation of the Moad family. Over its thirty seven year history, Rivers has gone through many stages of evolution and is now known as Rivers of Yarrambat. The garden centre features a restaurant style café, complemented by a health & wellbeing centre, personal training gyms and a hair & beauty studio. David enjoys the challenges of retail and the constant evolution of our dynamic industry. He travels widely to gain knowledge and insight into how overseas operators are developing their businesses to keep pace with their changing markets. 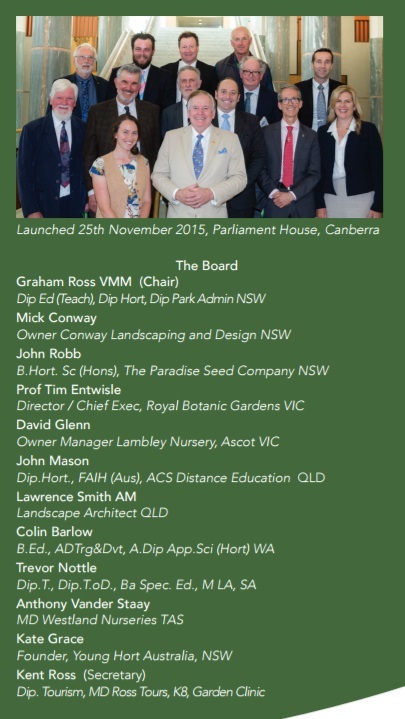 Graham Ross VMM, MAIH RH, Dip Ed (Teach), Dip Hort, Dip Park Admin. Graham has worked as a nurseryman, arborist, greenkeeper, seedsman, local government Head Gardener & parks superintendent, and Head of Division of Horticulture NSW TAFE, Principal Ryde School of Horticulture (Ret). He served 11 years as Honorary Trustee of the Royal Botanic Gardens, Sydney, appointed by Gov. Sir David Martin. Graham is only the fourth Australian to receive the Gold Veitch Memorial Medal from the Royal Horticultural Society (UK). He is the only person in the Southern Hemisphere to be awarded an Honorary Fellow of Royal Botanic Gardens Kew Guild London, he was awarded the Electronic Laurel, Radio Laurel and Gold Laurel & Hall of Fame -Australian Horticultural Media Association. Award of Excellence - Australian Institute of Horticulture, Award of Excellence and Award of Merit also Allan Seale Award-Nursery & Garden Industry NSW, Award of Merit -Nursery & Garden Industry Australia. Graham has been a national broadcaster with Macquarie /Fairfax Radio since 1980 with The Garden Clinic Show, national television garden presenter with Channel 7 since 1980and 21 years with Better Homes & Gardens TV. Host of Great Gardens of the World TV series. Author of five books on gardening and horticulture in Australia and co-founder Garden Clinic.dot com. Mick Conway is the owner /manager of Conway Landscaping and Design initially building high-end gardens in Melbourne for twelve years. Mick is the most experienced Australian in constructing international quality landscape show gardens. Mick constructed gold, silver and bronze medal winning gardens each year for the Melbourne International Flower and Garden Show, MIFGS. He built a show garden at the 2012 Chelsea Garden Show in London winning a Silver Guilt medal. Wes Fleming invited him back for 2013 to build Landscape Designer Phil Johnston's Chelsea Show Garden which won Gold and Best in Show. The next year 2014 hand-picked an Australian team to build Alan Titchmarsh's show garden. In 2015 Conway Landscaping and Design team built Australian garden at Chelsea for Charlie Albone winning Silver Guilt. Mick’s gardens have been published in many magazines and a handful of books. He has built for Landscape Designers who are known nationally and internationally, in styles from traditional Japanese to Formal English, Contemporary Australian to naturalistic native. Since 2012 Mick and his team at Conway Landscaping have built gardens in the Southern Highlands of NSW, constructing for renowned garden designers. Awarded BBM Scholarship to visit the UK and Europe. Elders Limited Scholarship funding provided to assist with tertiary education. The Horticultural Congress Trust Award, with attendance at the ISHS, International Horticultural Congress in Seoul. Global Author Publications Australia: More than 80 PBR (patent equivalent) applications written/co-written. USA: More than 25 Patent applications written/co-written/awarded. EU:	More than 15 CPVO (patent equivalent) applications written/co-written. New Zealand	More than 15 PVR (patent equivalent) applications written/co-written. John comes from a farming background in northern NSW, including dairy & mixed cropping. Studied at the University of Western Sydney – Hawkesbury. Worked in the Nursery industry for the past 23 years, particularly in the wholesale production sector. Primary focus has been on the breeding, development and introduction of garden plants suitable for Australian gardens. Experience in tertiary education sector (teaching at both TAFE & University levels over the years). Experience in import & export of plant material and associated biosecurity measures. Experience with garden tourism by close association with Paradise Gardens – one of Australia’s leading private gardens, owned by Mr Bob Cherry. Have travelled extensively around the world studying horticulture. Currently partner & director - The Paradise Seed Company Pty Limited: development of new plant varieties for the domestic & export markets. Australian Green Tea Pty Limited: breeding & development of new tea varieties for an emerging Australian green tea industry. Landscape Design, Install and Maintenance Garden Home business Auckland NZ. Market Gardening, Keri Keri NZ. Kent is a business management and marketing specialist. His skill set includes accounting and finance, human resources, advertising, marketing, travel operations and media buying. Kent established a division of Ross Garden Tours in London 2006-2014. Narelle graduated from Ryde School of Horticulture in 1985 and has since undertaken further study in Marketing, Environmental Management, Playground Standards and Therapeutic Horticulture. Extensive industry management experience has been gained through her work with leading retail and wholesale nurseries, specialist turf consultants, as Plant Protection Product Manager with Yates Australia Pty Ltd and as a Project Manager, Playground Advisory with Kidsafe NSW Inc. Narelle is a horticultural consultant for the Garden Clinic®™, Graham Ross Horticultural Consultants Pty Ltd.
Narelle’s experience includes business development and marketing, compliance and governance, research and writing. Throughout this time, she has gained an extensive botanical and technical knowledge. She is a member of the Australian Society of Horticultural Science, Cultivate NSW, The Royal Botanic Gardens Sydney Foundation and Friends, Australian Plants Society and Tropical Garden Society of Sydney. Kate Grace B. Ldscp. Arch. From country NSW, Kate was awarded the Sir John Pagan award for Horticulture in 2013/14 which led her to work on Gold Medal Award winning sshow gardens at the Chelsea flower show in London. Since returning home she has built a Gold medal Balcony show garden with her Husband Mick, at the Australian garden show Sydney 2014. She has founded a not for Profit Organisation, YoungHort Australia, an organisation to help encourage High School leavers to consider a career in Horticulture. She works in garden design and development in country NSW and has become an inspiration to young horticulturists, giving her time freely to further her passion for gardening among the youth of Australia. John Mason graduated with a diploma from Burnley Horticultural College in 1971. Worked variously as gardener, landscaper, nurseryman, horticultural consultant, community playground designer, lecturer; and municipal parks superintendent. Editor/principal writer for 4 national garden magazines; author of 150 books. Organised garden pavilion for Royal Agricultural Show in Melbourne; Principal ACS Distance Education: 36 years – developed 600+ courses (200 horticulture –also agriculture, business, environment, tourism, health). E book publisher. Lawrie established Landplan Studio in Brisbane 1974. Since then his company has grown to become one of Australia’s leading Landscape Architectural consultancies with a wide range of significant experience and expertise. Lawrie has concentrated on providing consultancy roles in specialised areas of his personal expertise – specifically Botanic Gardens. World Expo 88 the Australian Gardens at Liverpool International Garden Festival 1984, International Garden and Greenery Exposition Osaka 1990, Regional Botanic Gardens in Gladstone, Bundaberg, Mt.Isa, Longreach, Gold Coast, Barcaldine, Townsville, Maroochy, Tweed, Dubbo, Cairns, Mackay and Whitsunday. Lawrie has been instrumental in the staging of an International Garden Festival in Australia and was an integral part of the 1996 IGF proposals, initially in Brisbane then Melbourne. He was also involved in the Sydney (2000) and Brisbane (2000) submissions. Lawrie was responsible for the planning and design of the Roma Street Parklands and gardens, located on 16 ha of disused railway land and parkland in central Brisbane. Employment Experiences: Colin Barlow is a horticulturist, landscape designer, tour guide, teacher and garden writer. Colin originally trained as an apprentice horticulturist in England. After completing his studies in the UK he became a Parks Supervisor before immigrating to Australia and working as a Parks Technical Officer and 2IC to the Manager of Parks. Colin furthered his studies in Australia by completing an Associate Diploma in Horticulture and a teaching degree. He worked as Landscape Coordinator and lecturer at Challenger Institute of Technology for over 17 years. Colin is the Managing Director of his own landscape design and construction company, Gardens from Eden. Colin hosts a weekly television gardening segment on ‘Home in WA’ with Channel 7 Perth, is the gardening writer and the local gardening expert on 98.5 Sonshine FM radio. Colin has experience in leading gardening tours through Europe and Western Australia. Trevor Nottle Dip. T., Dip. T. o D., Bach. Spec. Ed., Master of Landscape Architecture, PhD candidate. Trevor is a garden historian and heritage consultant with commissions and project experience in Australia, New Zealand, Uruguay, California, Greece and Italy. He operates a solo consultancy for private garden owners. Trevor is also an internationally distributed author of 17 gardening books related to the above areas of expertise and have been contracted by publishing houses in Australia, New Zealand and the USA. From 1980 to 1990 he was the Education Manager ( Principal) of the School for Environment, Conservation & Horticulture for TAFE SA during which time he developed extensive industry and inter-governmental networks and working relationships, in particular those concerning educational training packages, national standards, programme auditing and evaluation, and the implementation of new national training packages for the emerging water industry, conservation and land management, pest and weed control, and new Diploma courses in garden design that were sold to international students. This qualification was articulated with the Bachelor’s Degree in Landscape Architecture at the University of Adelaide. His final initiative while at TAFE SA was as a Senior Project Manager tasked with developing new higher level skills qualifications for horticulture that would specialised skills areas at post- Diploma levels that would meet the needs of industry and institutions such as botanic gardens. During this appointment Trevor served on a committee led by Prof. Ian Blandy to develop a new commercial and domestic water-use policy and implementation strategy for the SA government. The outcome of the task force was the Water Industry Alliance, now headed up by Prof. Mike Young, Environment Institute, University of Adelaide.